Gambling’s already fun, but when it’s tied to a modified version of Zombie Dice with a holographic projection of a dude staring down the hungry horde with a six-shooter, it’s even cooler. 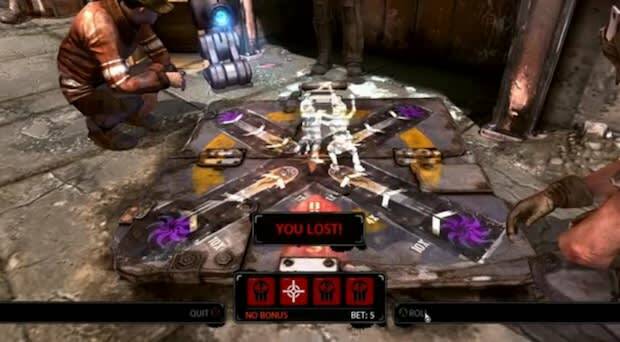 Adding a lot of excitement to what’s essentially a basic dice game, the Tombstone Dice Game in RAGE is the perfect distraction when you just don’t feel like driving across the game’s overly-expansive terrain with your supped-up dune buggy. Just be careful though, this is one with tough odds and moderate payouts; it’s flashy and fun but play too long and you’ll soon find yourself without the cash to afford your Wingstick addiction.